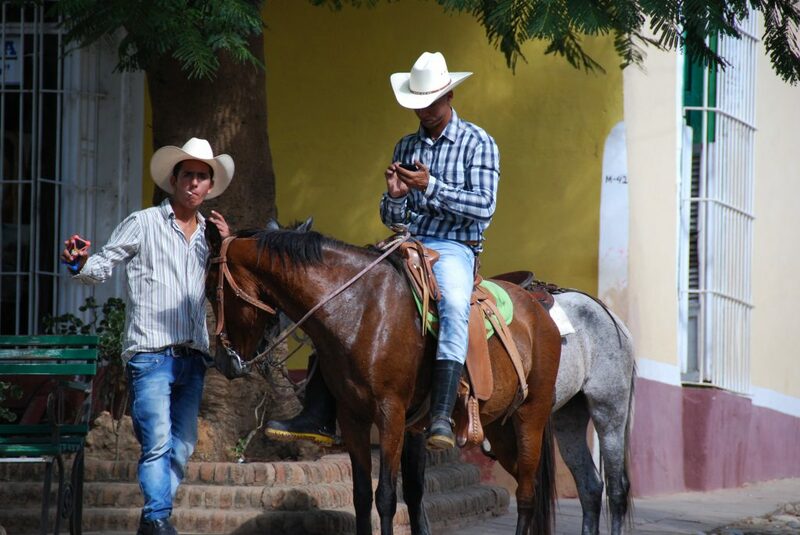 Cuban cowboys checking their phones in a public wifi zone. In 2017 we have a host of new localization subjects to explore. One is travel and tourism. I’ve traveled all over, but after spending ten days in Cuba, I can say it’s one of the most-visited and still least-touristy places I’ve been. From a tourist’s perspective, it’s aching for some seriously localized tourist amenities: wifi, online booking, straightforward, comfortable transportation, more English. However, the underlying reason it lacks these things is precisely why it is so appealing to tourists — it’s its own thing, not some foreigner’s version of itself. Although it is possible to find Air BnB listings in some places, the network of casa particulares needs no internet, relying instead on interpersonal networks of friends in other cities and getting a small cut. You can find a casa in Havana and have your entire trip planned for you by your host, taxis arranged, lodging arranged, everything. And even paying a few extra bucks for lodging, this is doubtless cheaper than redoing the infrastructure of the island nation. If you’re adventurous, it’s not hard to find transport and places to stay yourself, even just walking into a town; it may not be what you’d expect, but that’s, in part, what people pay for. They want to experience a place where the cars are so old that it’s standard procedure to pack 16 tourists into a 1950s-era army truck with plastic seats bolted to the floor and then drive for six hours in diesel fumes. They want to experience a place where McDonalds doesn’t exist. Where they have to be smart and savvy in order to get around the language barrier. Where they can take photos of men carrying hay through the streets by horse wagon, where they can buy socialized ice cream for four cents, where they can haggle and quibble and still have no idea if they’ve overpaid. Tourists, to a large degree, want the foreign. It’s why they travel. They also want the familiar, however: they want to be able to look on Yelp for restaurant reviews, and they want to be able to upload their photos to Instagram. The balance of keeping places their own thing, and localizing for tourists, is a delicate one. If you have expertise in this field, or in any of the others we’re covering this year, send us an email. We’re always looking for expertise.